For other hotels with similar names, see Astor Hotel (disambiguation). Hotel Astor was a hotel located in the Times Square area of Manhattan, New York City, in operation from 1904 through 1967. The former site of the hotel, the block bounded by Broadway, Astor Plaza, West 44th Street, and West 45th Street, is now occupied by the high-rise 54-story office tower One Astor Plaza. 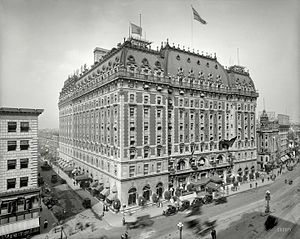 With its elaborately decorated public rooms and its roof garden, the Astor Hotel was perceived as the successor to the Astor family's Waldorf-Astoria on 34th Street. William C. Muschenheim and his brother, Frederick A. Muschenheim conceived plans for the grand hotel in 1900. The area was then known as Longacre Square and stood beyond the fringe of metropolitan life, the center of New York's carriage-building trade. The Muschenheim brothers became the proprietors for absentee landlord William Waldorf Astor, from whom they leased the land. The hotel opened on September 9, 1904. The 35,000 square feet (3,300 m2) Hotel Astor was built in two stages, in 1905 and 1909–1910, by the same architects in the same style. Upon completion, the structure occupied an entire city block at a reported total cost of $7 million. Architects Clinton & Russell had designed a number of Astor commissions; here they developed a very Parisian "Beaux Arts" style completed with green-copper mansard roof. Its eleven stories contained 1000 guest rooms, with two more levels underground for its extensive "backstage" functions, such as the wine cellar. The Astor was an important element in the growth of Times Square and its character as an entertainment center. In 1904, New York Times publisher Adolph S. Ochs moved his newspaper's operations to a new tower on 42nd Street in the middle of Longacre Square, and Ochs persuaded Mayor George B. McClellan, Jr. to build a subway station there and rename it Times Square. The Theater District would soon occupy magnificent new auditoriums along Forty-second Street, and electric lighting transformed this strip of Broadway into the "Great White Way". Hotel Astor's success triggered the construction of the nearby Knickerbocker Hotel by other members of the Astor family two years later, although that property became commercial office space within a few years. The Astor set the pattern for "a new species of popular hotels that soon clustered around Times Square, vast amusement palaces that catered to crowds with scenographic interiors that mirrored the theatricality of the Great White Way." Within its restrained exterior, the Astor featured a long list of elaborately themed ballrooms and exotic restaurants: the Old New York lobby, the American Indian Grill Room decorated with artifacts collected with the help of the American Museum of Natural History, a Flemish smoking room, a Pompeiian billiard room, the Hunt Room decorated in sixteenth century German Renaissance style, and many other features. The Large Ballroom (or Banquet Hall), on the ninth floor, opened on September 29, 1909 with a dinner that was part of the Hudson-Fulton Celebration. Measuring 50 by 85 feet (15 m × 26 m), the Banquet Hall was decorated in the Rococo style of Louis XV and featured a high-groined arch ceiling in ivory white and old gold, supported by grouped caryatids. A gallery spanned the south and west sides, affording a fine view of the room, which could accommodate 500 diners. The smaller ballroom, seating 250, was decorated in the neoclassical Louis XVI manner and could be joined with the larger ballroom. Still another adjoining room, "The College Hall", could also open to the ballroom so that the combined rooms could seat up 1,100 persons. The Palm Garden, or "L'Orangerie", located in the rear of the first floor lobby, was intended to represent an Italian garden. Its ceiling, painted to represent a Mediterranean sky, was partly concealed by feigned vine-covered pergolas. Blue lighting, hanging lamps draped in vines, swaying fern baskets, and scenic pictures of the out-of-doors further enhanced the perception. The rooftop garden, with bandstand and observatory, was one of a number constructed in the city between 1880 and Prohibition, among them the American Theater on Eighth Avenue, the garden atop Stanford White's 1890 Madison Square Garden, and the Paradise Roof Garden opened by Oscar Hammerstein I in 1900. In later years, the noted landscape architect Takeo Shiota redesigned the roof's North Garden on a Japanese theme. Artwork in the original lobby included four murals by William de Leftwich Dodge depicting Ancient and Modern New York. The ballroom held a marble group called the Three Graces, by sculptor Isidore Konti, with all three figures modeled on Audrey Munson, along with murals by designer Edward G. Unitt. As a popular meeting place and New York City landmark, the Astor had a place in popular culture for decades, from the extended double entendre song "She Had to Go and Lose It at the Astor", to its appearance in the 1945 film The Clock, which provides a good view of the wartime-era lobby (although reconstructed in Hollywood). Among many other musicians, the swing era bandleader Tommy Dorsey appeared regularly on the rooftop bandstand, and it was there that Frank Sinatra made early New York appearances with Dorsey's band from 1940 to 1942. Another regular, in the 1950's, was Carmen Cavallaro and his orchestra, advertised on the marquee under the banner "On the Astor Roof". In 1947, stuntman John Ciampa scaled the exterior of the hotel as part of a publicity ploy for the Sunbrock Rodeo and Thrill Circus. A 1947 post card, Hotel Astor claimed "1000 rooms, 1000 baths" and as "The Crossroads of the World"
Beginning in the 1910s, the Astor Bar acquired a reputation as a gay meeting place. During World War II, the Astor Bar was one of three American hotel bars "world famous for their wartime ambience", alongside the Top of the Mark at the Mark Hopkins Hotel in San Francisco, and the men's bar at the Los Angeles Biltmore. Unlike the flamboyant late-night scenes at the automats, gay patrons at the Astor Bar were welcomed, allotted an entire side of the oval bar, and expected to be discreet (by the standards of the time). Thus "the Astor maintained its public reputation as an eminently respectable Times Square rendezvous, while its reputation as a gay rendezvous and pickup bar assumed legendary proportions." The bar was further immortalized in Cole Porter's song "Well, Did You Evah! ", which includes the line, "Have you heard that Mimsie Starr / Just got pinched in the Astor Bar?" The ribald tune "She Had to Go and Lose It at the Astor" explored a similar theme. The hotel was completely renovated in 1935, and again in 1949. It was sold to real estate entrepreneur William Zeckendorf on September 1, 1954. However he sold it again just two weeks later, on September 15, 1954, to Sheraton Hotels, who renamed it the Sheraton-Astor. Zeckendorf repurchased the hotel in December 1957, regaining control of it in March 1958 and returning it to its original name. During this period, the hotel was managed by Prince Serge Obolensky. As an indirect result of Zeckendorf's 1965 bankruptcy, the Astor was sold for $10.5 million in 1966. It closed and was demolished in 1967 by Sam Minskoff & Sons. The site is now occupied by a 54-story skyscraper designed by Der Scutt of Ely J. Kahn & Jacobs and completed in 1972. ^ Bloom, Ken (2007). Routledge Guide to Broadway. Routledge. p. 13. Retrieved 24 February 2019. ^ a b c d Bloom, Ken (2007). Routledge Guide to Broadway. Routledge. pp. 14–15. Retrieved 5 September 2016. ^ a b Stern, Robert A.M.; Gilmartin, Gregory; Massengale, John (15 January 1992). New York 1900. Rizzoli. (Subscription required (help)). ^ Rider, Fremont, ed. (1916). Rider's New York city and vicinity, including Newark, Yonkers and Jersey. p. 171. Retrieved 2014-11-06. ^ Lancaster, Clay (May 1983). The Japanese influence in America. Abbeville Press. ISBN 978-0896593428. ^ "Hotel Astor, Time Square". CardCow. Retrieved 2014-11-06. ^ a b Taylor, William R., ed. (22 April 1996). Inventing Times Square: Commerce and Culture at the Crossroads of the World. Johns Hopkins University Press. p. xxiv. ISBN 978-0801853371. Retrieved 2014-11-06. ^ Berube, Allen (April 1990). Coming Out Under Fire. Free Press. p. 114. ISBN 978-0029031001. Retrieved 2014-11-06. ^ Hellman, Geoffrey T. (25 October 1958). "Astor's Obolensky". The New Yorker: 36. Retrieved 2014-11-06. (Subscription required (help)).